Good Morning, Isn’t is great summer has finally arrived at our doorsteps it couldn’t have come any sooner. As our kids complete school I know that many of you are wondering what to do with the kids this summer.. There are so many free or low cost things that can be done in the city. From a puppet festival in Brooklyn to a fish parade in the Bronx, June is full of free festivals, fairs and parades for families to enjoy this summer. Scroll through the below list and make sure to mark these family activities on your calendar. Thanks to TimeoutKids, I have the scoop on all the best summer concerts for families. Many of the series kick off in June with big-name performers including Audra Rox at Madison Square Park (June 12) and Karen K and the Jitterbugs at Carroll Park (June 23). Dozens of police cruisers from days of yore, as well as TV-show autos like the Batmobile from the 1960s series, go on display outside what used to be New York City’s 1st Precinct. Car owners will answer questions throughout the afternoon. Sat June 9 10am–4pm. New York City Police Museum. Free. All ages. The borough’s more-manageable LGBT celebration—a week before the big shindig in Manhattan—includes music acts, food vendors, craftspeople, nonprofit booths and a dedicated kids’ play area with storytime, puppet-making workshops and more. Sat June 9 at 11am. Prospect Park West at 15th St, Park Slope, Brooklyn (brooklynpride.org). Free. All ages. The Staten Island Museum’s annual environmental fair is back again (this time at Willowbrook Park, by the carousel) with a wealth of family offerings. Kids can try to find various animals and plants in a scavenger hunt, take a nature walk with a Staten Island Museum naturalist, check out a beekeeper demonstration (no worries; it’s safe) and get busy at the Mad Scientist table with “hair-raising experiments.” Also on the roster is an Up Close with Staten Island Nature station where little ones get to explore the likes of tortoise shells and fossils. Snacks will be available for purchase at the carousel concession stand.Sat June 9 11am–3pm. Willowbrook Park. Free. All ages. Governors Island explodes with artistic energy at this weekend devoted to outside-the-box creativity. Kid-centric highlights include the mini-golf course “Arcade” and an interactive sculpture garden, while other activities include face-painting and sculpture-making sessions. Sat June 9, Sun June 10 10am–6pm. Governors Island. Free. All ages. Honoring the bonds of Lower Manhattan’s Jewish and Chinese communities, the Museum at Eldridge Street goes ova-board with this annual block party. A klezmer march and Chinese acrobatics are followed by art activities for kids, calligraphy workshops, Yiddish- and Chinese-language lessons, and of course, plenty of the festival’s namesake snacks.Sun June 10 noon–4pm. Eldridge St between Canal and Division Sts (212-219-088,eldridgestreet.org). Free. All ages. For more than a half-century, tens of thousands of costumed musicians, baton twirlers, school groups and cultural organizations—not to mention about 3 million spectators—gather to honor the city’s Puerto Rican community. This year’s parade theme is “Puerto Ricans in Higher Education.” Be forewarned: The parade gets crowded and, at times, boisterous. Sun June 10 at 11am. Fifth Ave from 44th to 79th Sts (718-401-0404,nationalpuertoricandayparade.org). Free. All ages. Once a year, a mile of Fifth Avenue (between 82nd and 105th Sts) is closed to traffic for the ultimate street fair. This year, nine museums within that stretch open their doors to the public free of charge (among them El Museo del Bario, the Museum of the City of New York, the Jewish Museum, the Guggenheim and the Met) and offer families a slew of kid-friendly activities, including a special chalk drawing project in front of the Museum of the City of New York. Also look for live music, magicians and clowns performing on the grand avenue. Check our guide to the night’s festivities for more specifics. Tue June 12 6–9pm. Fifth Ave between 82nd and 105th Sts (212-606-2296, museummilefestival.org). Free. All ages. What originally began as a protest of the Fulton Fish Market has evolved into a neighborhood institution, loosely modeled on Coney Island’s infamous Mermaid Parade. Marine-costumed revelers march from Hunts Point Riverside Park to Barretto Point Park, where the festivities continue with games and performances for kids of all ages. Sat June 16 10:30am–5pm. Parade starts at Hunts Point Riverside Park at 10:30am; festival is atBarretto Point Park noon–5pm. Free. All ages. You might want to bring the earplugs: This annual percussionfest gets very loud, with 12 hours of free live music played by hundreds of musicians. Sun Jun 17 noon–midnight.World Financial Center Winter Garden. Free. All ages. Aaron Friedman’s annual day of music kicks off across the city with mass musician meet-ups, with the likes of clarinetists and toy-piano players. Music lovers can unite throughout the day to take in impromptu performances and parades, featuring everyone from high-school up-and-comers to more recognizable names. Thu June 21 dawn–10pm. Various locations (makemusicny.org). Free. All ages. 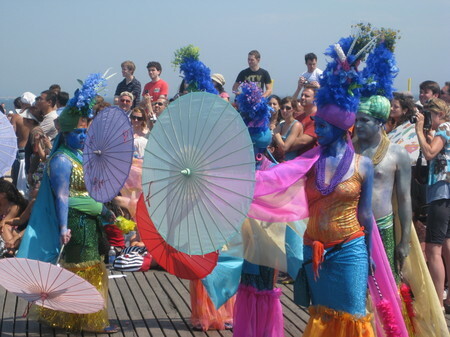 Coney Island’s answer to Greenwich Village’s infamous Halloween Parade might be a little risqué for some tiny ones, but plenty of families scope out King Neptune as he presides over wacky floats, marching bands and a dazzling array of scantily clad, seafaring sirens.Sat June 23 at 2pm. Surf Ave from W 21st to W 10th Sts, Coney Island, Brooklyn (coneyisland.com). Free. All ages. Young kite enthusiasts are invited to catch a breeze from the river during this high-flying event. Kids can bring their own kites or purchase one on-site. Sat June 23 10am–2pm.Brooklyn Bridge Park, Pier 1. Free. All ages. Families learn about aquatic ecology at this annual celebration that includes catch-and-release fishing in the Harlem Meer. Fish-themed crafts and a microscope activity with the New York Microscopical Society will be offered to kids. From 12:30 to 2pm, check out a storytelling performance featuring the Magic Goldfish. Sat June 23 noon–3pm. Central Park, Charles A. Dana Discovery Center. Free. All ages. The Andean Festival of the Sun celebration includes performances by the Ecuadorian dance group Ayazamana. While you’re at the museum, explore the many exhibits that teach kids about the Native people of the Americas. Sat June 23 2–4pm. National Museum of the American Indian. Free. All ages. With help from the NYC Parks Rangers, kids learn how to cast a line, get a fish nibbling and reel in the catch. Or simply take part in river-related activities and aquatic arts and crafts. Fishing equipment is provided. Sat June 30 11am–3pm. West Harlem Piers Park. All ages. PS: Task for the day: Always try to go out with little lip gloss, even if your going to the corner store.. When you look good, you feel good.. Standup Latina and be Proud!